Inspired by mid-century blueprints, these fetching framed prints celebrate your favorite dog breed. Your dog is already the center of your life--why not make it centerpiece of your home or office, as well? 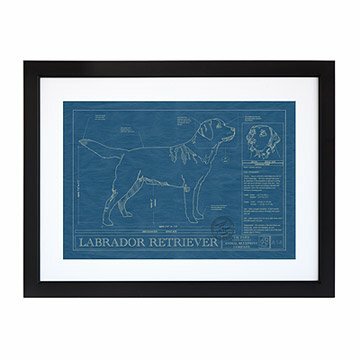 This large version of our classic Dog Blueprints makes a handsome visual statement of the outsized loyalty your feel for your favorite, four-legged friend. Created in the style of mid-century blueprints (designed by architect "I. M. Paws"), this detailed illustration of your chosen breed is accompanied by "design specs" and documentation about breed origins and temperament. Each blueprint is given a distressed finish, creating the appearance of an authentic, vintage document. Made in Portland, Oregon. Click here Additional Dog Breeds Available. Check out our smaller version of the Dog Blueprints here and the personalized version of the Dog Blueprints here! Please note, not all dog breeds are in alphabetical order. You might have to scroll to the end of the drop down to find your Wheaten Terrier. As a breeder of Bernese Mountain Dogs this makes a perfect edition to my home. Bonus points for the fact that it is in all the perfect colors. I have had many dog loving friends comment on how cool and original it is. I am not a cheesy art person. This has some class to it that I appreciate.